We picked Bullwinkle up at the dealership on Friday. We spent a couple of hours with our service attendant “Mac” who introduced us to Bullwinkle from top to bottom, back to front, inside and out. As P joined Mac to poke in and around various compartments and under the hood, M shot video in hopes of preserving critical information we would mostly forget. There’s a lot to know about a 32-foot motorhome! We need all the help we can get. After we were checked out on the moose, we signed a bunch of paperwork. That, combined with the big check we wrote, were powerful reminders that this is a house. With that, we unloaded the car and “moved in”. Then we made a quick trip to the grocery store for weekend provisions. Some five hours after our arrival, it was finally time to hit the road. We’d designed our shakedown cruise to place the dealership between our first campground and home…just in case. So, we headed north 75 miles into smoky Gold Country. P took command of our new toy with confidence and ease. We pulled into the River Reflections RV Park in Oroville some 90 minutes later. Under normal conditions, this popular spot on the Feather River is crowded with enthusiastic fishermen and their families. But, with this summer’s non-existent salmon season and 1000 or so wildfires burning in Northern California, the campground was pleasantly peaceful. With the moose safely parked, we set up camp and started to unpack. On our first trip of several to the dumpster, we went for a short stroll around the grounds. Along the way, we met a group of Winnebago-Itasca owners. 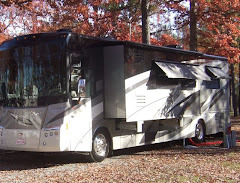 The “Chardonnay Travelers” are a chapter of the Winnebago Itasca Travelers, a nationwide club. They were as welcoming and supportive as could be. They congratulated us on our new purchase and offered many an encouraging word. And, they invited us to dinner Saturday night. Great people. After our first (and very restful) night’s sleep in our new home-away-from home, we woke up to a bit less smoke in the skies. But, as you can see in the pic, the sun (that barely visible disc in the upper left corner) was still quite obscure. We spent the day reading manuals (there are many), doing a bit of geocaching, and walking four miles to buy a bottle of wine for dinner. Our first major motorhome purchase will be a bike rack…and soon. Having the bikes on board would have made wine shopping a breeze. Dinner with the WIT group was quite fun. We’re planning on joining them for future outings. We look forward to that! Before we knew it, it was late Sunday morning and time to hit the road once again. We broke camp like a couple of pros. M took the wheel for the first leg of the trip, back to the dealership. Bullwinkle was absolutely trouble-free on the trip, and there was no need to leave him there. So, we picked up the car and caravanned to Camping World for some essentials, then on to our storage spot. P gets extra gold stars for managing the moose through Sunday afternoon Bay Area traffic! By the time Bullwinkle was tucked safely away in his new home, we were beat. While the weekend was big fun, it was definitely big – filled with the kind of “good stress” than can leave you exhausted. And, we just can’t wait to go out again! Yep, we did it. We bought a motorhome! 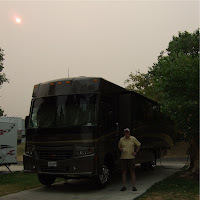 This is “Bullwinkle”, our 2008 Winnebago Voyage. He’s 32-feet long, 13-feet tall and weighs in at 22,000 pounds. He really is a moose! His name came naturally. Not only does his name fit his “physique”. His traveling companion will be “Rocky” our Jeep Wrangler, which we’ll eventually tow behind this moose. Yes, we’re already referring to ourselves as Boris and Natasha! Here’s to safe travels, relaxing weekends, fantastic vacations and the new friends we’ll meet along the way.